When dealing with the topic of risk analysis, most books on investments treat downside and upside risk equally. 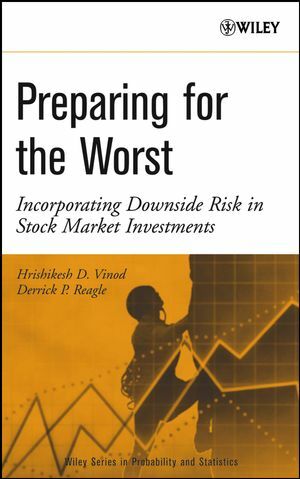 Preparing for the Worst takes an entirely novel approach by focusing on downside risk and explaining how to incorporate it into investment decisions. Highlighting this asymmetry of the stock market, the authors describe how existing theories miss the downside and follow with explanations of how it can be included. Various techniques for calculating downside risk are demonstrated. HRISHIKESH D. VINOD, PhD, is Director of the Institute for Ethics and Economic Policy and Professor of Economics at Fordham University in New York. He is also a Fellow of the International Institute of Public Ethics and of the Journal of Econometrics. DERRICK P. REAGLE, PhD, is Associate Chair for Graduate Studies in the Department of Economics at Fordham University. 1. Quantitative Measures of the Stock Market. 1.1. Pricing Future Cash Flows. 1.4. Modeling of Stock Price Diffusion. 2. A Short Review of the Theory of Risk Measurement. 2.1. Quantiles and Value at Risk. 2.2. CAPM Beta, Sharpe, and Treynor Performance Measures. 2.3. When You Assume . . . .
2.4. Extensions of the CAPM. Appendix: Estimating the Distribution from the Pearson Family of Distributions. 3. Hedging to Avoid Market Risk. 3.1. Derivative Securities: Futures, Options. 3.3. Option Pricing Under Jump Diffusion. 3.4. Implied Volatility and the Greeks. 4. Monkey Wrench in the Works: When the Theory Fails. 4.1. Bubbles, Reversion, and Patterns. 4.2. Modeling Volatility or Variance Explicitly. 5.1. VaR and Downside Risk. 5.2. Lower Partial Moments (Standard Deviation, Beta, Sharpe, and Treynor). 5.3. Implied Volatility and Other Measures of Downside Risk. 6. Portfolio Valuation and Utility Theory. 6.3. Incorporating Utility Theory into Risk Measurement and Stochastic Dominance. 6.4. Incorporating Utility Theory into Option Valuation. 6.5. Forecasting Returns Using Nonlinear Structures and Neural Networks. 7.2. Patterns of Downside Risk. 7.3. Downside Risk in Stock Valuations and Worldwide Investing. 7.4. Downside Risk Arising from Fraud, Corruption, and International Contagion. 8.2. Matrix-Based Derivation of the Efficient Portfolio. 8.3. Principal Components Analysis, Factor Analysis, and Singular Value Decomposition. 8.5. Creation of Risk-Free Nonrandom g(S, t) as a Hedge Portfolio. 8.6. Derivation of Black-Scholes Partial Differential Equation. 9.1. Sampling, Compounding, and Other Data Issues in Finance. Appendix A: Regression Specification, Estimation, and Software Issues. Appendix B: Maximum Likelihood Estimation Issues. Appendix C: Maximum Entropy (ME) Bootstrap for State-Dependent Time Series of Returns.